The sun finally came out again!!! I’m making the most out of it by dressing up all summery in watercolor floral prints. I love how they’re not like the usual watercolor prints. They’re much more vibrant and bright–perfect for the weather! I can already see my mom stealing this top from my closet. She loves chiffon tops like this! It’s really pretty how the floral print goes all the way to the sleeves instead of just on the body. I then matched my top with this floral skirt from Zara. Although the floral print on it doesn’t really resemble my top’s, they still look quite good together and transition from one to the other smoothly. See, this is what I’ve been saying all along. Fashion really has no rules. I mean there are a few tips that can help us along the way, but at the end of the day, if it works, it works. To complete my look, I tried to add more greens and blues through my accessories to balance off the pinks and oranges from my top and bag. This is a great way to make the entire look more cohesive and put-together. I’m having a problem going out on a print on print outfit. I’m too scared because I don’t know if I can carry it. Can you please give me some tips on how to match them. It would really be a great help! Bet na bet and skirt. Hahahahaha I’m glad I’m not the fish GG :) Thanks Judc! nice! you look really pretty and fresh in here Miss Camille. when i saw this, I thought it was a dress! :) I agree fashion has no rules. it is everywhere! i really love it. and the green wedges and ring, BONGGA! love the look, the dress has such an amazing fit on your body, and love the colors! You always manage to pull off print on print outfits fabulously, but this one’s just a bit too much on the eyes. Sorry, no offense though. Ganda mo lang. :) FRESH! spell freshness C-A-M-I-L-L-E :) I also love florals..florals+chiffon=great..I think they look so feminine and nakakaganda sila.haha..I don’t know I just feel though..I also love those shoes and your orange bag they really look good together on your skirt and top. :D it really works. Nakaka fresh ang florals! :) Thanks Carla! Hi Ms. Camille!!! GAAAH!!! you are so drop dead gorgeous :D can i ask? well how do you do that fierce face cause whenever we try it its just looks like “bangag” LOL love you! Hahahaha I do too, kala mo lang hindi haha! :) I don’t know really! Take notes from Tyra Banks? Haha! my ghod! You literally took my breath away Miss. I love your outfit here. It’s so cool in the eyes. And everything from your hair to your shoes is really. . . . . can’t find the right words. Its just simply BEAUTIFUL! Yes! Haha I know! Summer in Septmeber :) Thank you Joyce! This outfit looks chaotic and not in a good way. I love most of your looks but this is a miss for me. I have to agree! Fashion has no rules. It has no boundaries. :) Nice outfit, Camille! Thanks Marie! I’m sure you can! Hahaha kung makachismis lang :) Thank you Emmrose! Ahhhh… You took my breath away Camille. Grabe. As in grabe. Ang ganda at ang galing mo talaga. Thank you Tricia! My voice is so tiny!!! 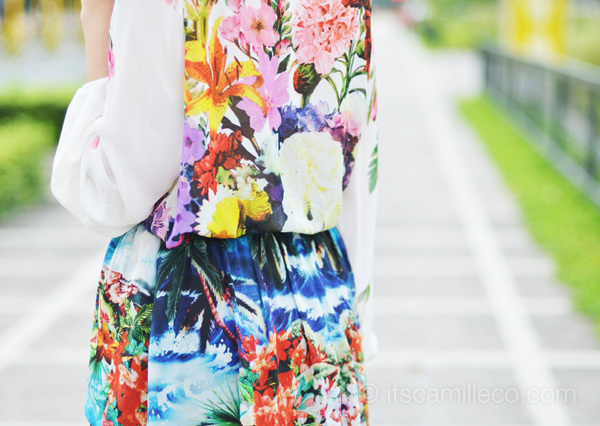 Hi miss Camille :) I love your floral outfit! I always can’t wait of what will you wear next, and as expected you never run out of inspiration when you’re putting your clothes altogether :) THANKS FOR INSPIRING ME <3 GOD BLESS.. This combination of different prints rocks! I would never say, that I could actually like it, but it looks great on you :) B.
so LURV the ensemble….. very striking and wearing watercolor floral prints will definitely completes and brightens up more your day…..
:-O I’m always impressed by your necklaces. Everytime I saw your necklaces on your oufits, I thought they’re one big statement necklace. But in fact you usually put several together and they turn out to be so perfectly matched! Wonderfu! I love this outfit, the colours look great together, and they look great on you! Love the shoes and bag! I’m sure ang ganda ng scenery dyan! I wish I can visit Vigan too! Tu es belle comme toujours! La tenue te va à merveille! I love how you mix accessories especially when it comes to necklaces! Do you take off your rings when dining? Some people do eh. I don’t know as well. I just do it for some reason :) I feel much more free! i so love your fashion sense ate camille. <3 how i wish bagay din sakin kahit anong e suot ko.. Take care always & God Bless! Gorgeous outfit! I really love that floral prints. 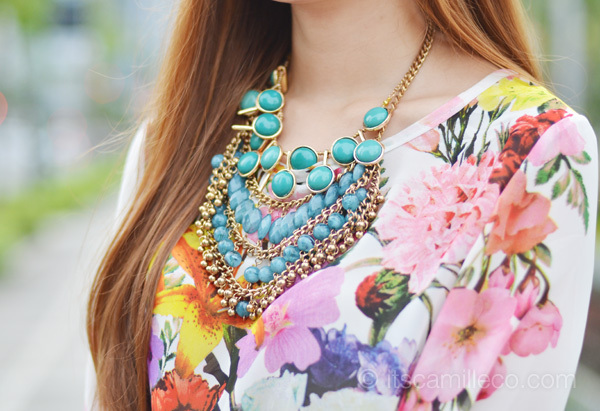 The combination with the necklace is perfect! The way you paired the patterns is unique!Great job!! Beautiful outfit as usual, Camille! :) so love the top and the wedges! 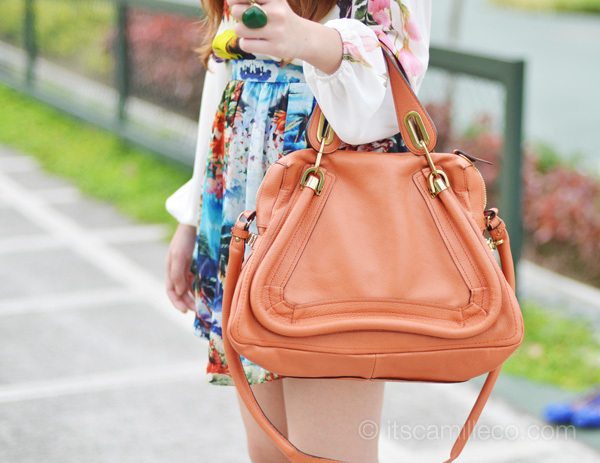 Ƹ̵̡Ӝ̵̨̄Ʒ ow Gosh, u really made me love floral printed outfits:) ♥ i so love you camille.. you’re like a goddess of a Garden Ƹ̵̡Ӝ̵̨̄Ʒ dyosang dyosa! I love green.. I love the wedges..